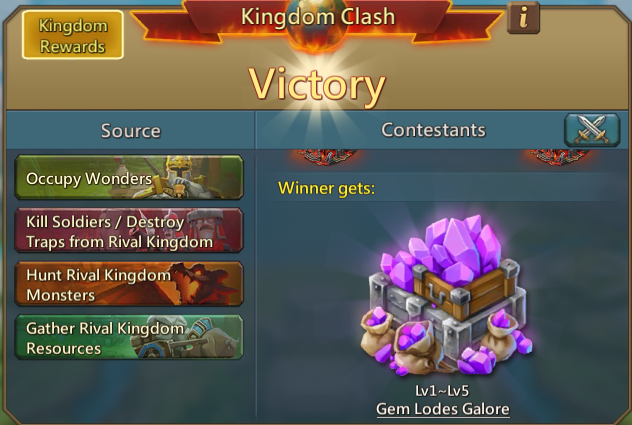 After the thrilling KVK, Gem lords will spawn in victorious kingdoms at every 6 hours for 24 hours. 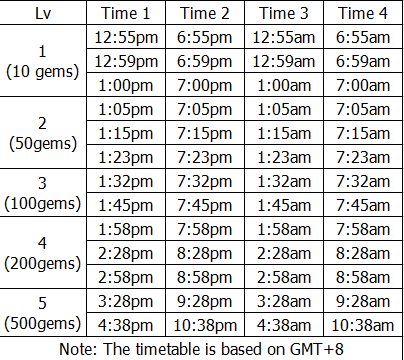 Many members in my guild asked when will the gem lords respawn, so I collected the timetable for them. And I also wanna share it with you guys. Happy gathering! -Without research, it take approximately 10 seconds to harvest 1 gem. -Items such as 50% gather boost, and talent points in gathering speed, will not affect gem harvesting rate. Only the gem harvesting research in the economy tab and Gemming Gremlin's skill (unlock at adult stage) can help. How to maximise gem gathering efficiency? -Use Tier 1 Calvary troops (cataphract) to gather. They are the fastest units, and you won't have to worry about them getting wounded or killed because they are cheap to produce. -Equip travel speed items. A good relic set for this is the saber fang set. -Shelter all your infantry and ranged units if possible, leaving only your Calvary troops behind so that you can auto select your gathering troops faster. -Relocate to a desolate place, such as the edge of the map. However, don't go to corners because most people will get there as well, thinking that its the least populated areas. Keep harvesting Lvl 1s and 2s. The moment you see Lvl 3s spawning, don't hesitate to recall your troops from Lvl 2s and use them to harvest lvl 3s instead. It's okay to leave unfinished gem lodes because you can always come back for them later. Here comes the tricky part. New batches of Lvl 4 and Lvl 5 gem lodes always spawn before you can finish your current Lvl 4/5 gem lode. Therefore, you have to recall your troops from your unfinished gem lodes so that you can harvest the next batches of Lvl 4/5s. As a simple guideline, recall your troops when they are 80-85% done. For example, recall your troops when 160-170 gems have been harvested in Lvl 4 gem lodes, and when 400-420 gems have been harvested from a Lvl 5 gem lode. However, this may differ slightly according to your troop travel speed and travel distance, so do adjust accordingly. By following this simple guide, you can get at least 5000gems with every batch of gems. Stay safe and happy gathering.